By the first decades of the eighteenth century, Maryland's transportation system consisted of numerous navigable waterways (Augustine Herrman's 1683 map gave depth soundings for many of them), and a rapidly growing network of roads. Attesting to the influence of the General Assembly's 1699 and 1704 road-signing provisions, "three notch'd roads" (leading first to ferries, then in some cases to bridges) are known to have existed in Prince George's County, Baltimore County, and St. Mary's County (Sioussat 1899:120-121). The "good and substantial" bridges desired were also being built; although evidence is scanty concerning their construction, these structures were evidently of timber. As the tobacco-boom economy moderated somewhat and Maryland agriculture diversified, eighteenth century Maryland witnessed further official efforts to improve roads and bridges, as well as aid the counties in their continuing administration of transportation policy and road work (Gould 1915:123-169). In the General Assembly, these efforts culminated in enactment of the first Maryland turnpike legislation, a new general road law, and the earliest recorded state law mandating a movable-span bridge at a commercially strategic site. The importance of road overseers and road and bridge maintenance was fully recognized by the legislature, which in 1715 exempted "overseers of highways" from jury duty (Kilty 1808:April 1715 Session, Chapter 37). Strong evidence concerning the prevalence of simple timber beam bridges in early eighteenth century Maryland comes from a 1724 law which gave overseers the right to confiscate for bridge repair any suitable trees on adjacent lands, provided that such trees "be such as are not fit to make clapboards, or cooper's timber, nor for the building or repairing any bridges that are built and maintained at a public or county charge" (Gould 1915:136). The 1724 act also noted that "the several bridges that have been heretofore over the heads of rivers, creeks, branches, swamps, and other low and miry places, are very much broken and out of repair, and several new bridges are still wanting" (Gould 1915:136). The 1724 law was renewed in 1751. Not until 1795 did the state grant compensation to the owners of timber confiscated for use in repair or erection of bridges (Gould 1915:136). The major roads built during the 1700-1800 period were almost exclusively county or privately built and maintained farm roads, but the counties, like the General Assembly, responded to economic pressures and developing patterns of emigration, settlement, and trade (Sioussat 1899:119-125). The principle of least geographic resistance demanded that the earliest major north-south routes pass through Maryland on either side of the Chesapeake Bay. Probably in existence by 1720, these north-south roads served as early overland links between Philadelphia and Virginia and were described by transportation historian Clarence Gould: One branch ran down the Eastern Shore, crossed the Elk River at Bohemia Manor, thence to Frederick and Georgetown on the Sassafras River, thence to Chestertown on the Chester River, thence either to Rock Hall or east neck island on the bay side of Kent County and by boat to Annapolis, or across the river at Chestertown and down through Queen Anne's County to Kent Island, where a boat was taken for Annapolis. The other branch of the road [from Philadelphia] reached Annapolis around the head of the bay, running past the head of Elk River to North East, to Susquehanna ferry near Port Deposit, to Joppa, to Baltimore, thence either across the Patapsco at Ferry Bar or around by Elk Ridge, and to Annapolis. A little way from Annapolis, the road again divided, one branch crossing the Patuxent at Queen Anne Town and leading to Upper Marlboro and Addison's ferry opposite Alexandria, and the other crossing the Patuxent at Nottingham and passing through Piscataway to the main ferry across the Potomac near the mouth of Pope's Creek [Gould 1915:125]. As Maryland colonial settlement progressed westward, the "Great Wagon Road" and its offshoots were gradually extended by the 1730s from the key port of entry at Philadelphia into the Maryland hinterland between Frederick and Hagerstown (Rouse 1973). Numerous settlers, especially the so-called "Pennsylvania Germans" of German or Swiss heritage, utilized these routes into the rich farm valleys of western Maryland. Meanwhile, Prince George's County by 1739 had a network of more than fifty roads and had authorized a road up the Potomac Valley to the mouth of the Monocacy River (Pearl et al. 1990). The latter location, from an early date the site of a large grain mill as well as an important ford of the Potomac, was linked to Baltimore by the 1750s. Roads which today bear names such as "Monocacy Road" and "West Old Baltimore Road" in Montgomery and Frederick counties are legacies of this trade pattern involving carriage of goods from Virginia through "Mouth of Monocacy" to Baltimore Town, founded in 1729 but greatly boosted by this western overland connection (Lubar 1991:19-26). In the far western portion of Maryland, military action during the French and Indian War occasioned the building of Braddock's Road in 1755, linking Fort Cumberland, near present-day Cumberland, with the Pittsburgh region through what are now Allegany and Garrett counties. Braddock's road remained a rough route west until it was superseded in the early nineteenth century by the largely parallel National Road, the first federally built road in the United States. The Cumberland vicinity was also linked during the 1750s by a military road to Fort Bedford (at modern Bedford, Pennsylvania), where British troops mustered for the 1758 attack on the French Fort Duquesne (at present Pittsburgh) (Leviness 1958:13-17). The Tidewater and lower Piedmont regions, by contrast, were characterized by the tobacco-related "rolling roads." There were also overland portage routes at locations in Cecil County and Talbot County where the navigational heads of Delaware River tributaries and Chesapeake Bay feeders were only a few miles apart (Gould 1915:127-128, 142-144). Large casks of tobacco were rolled by main force, or pulled by draft horses, along rolling roads that connected plantations with river landings. By the mid-eighteenth century, although county courts and the General Assembly had long recognized the damaging and cheapening effects such transportation over many miles had on the packed tobacco, laws were passed to regulate but not prohibit the system of rolling roads. These Eastern Shore portages remained economically useful into the nineteenth and twentieth centuries, when they became the routes of improved roads, turnpikes, railroads, and the Chesapeake and Delaware Canal (Gould 1915:127-130, 142-143). A larger transportation network, however, did not necessarily bring better road conditions. Eighteenth century travelers repeatedly noted that even the major post roads to Annapolis were enclosed by dark forests; planters and farmers kept the through road back from the edge of their property in order to maximize cultivated acreage (Gould 1915:131-132). The eighteenth century growth of Baltimore as a market city, the expansion of wheat growing in Maryland, and early industrialization in the form of gristmills and iron furnaces also kept the General Assembly's attention focused on the sometimes alarming gap between the ideal and the real on Maryland's roads (Olson 1980:5-9). Laws of 1753 and 1756, noting that in icy weather travel to Annapolis was often interrupted, took steps to guarantee that millers preserve existing bridges and build new ones over millraces and tailraces (Kilty 1808:October 1753 Session, Chapter 16, and October 1756 Session, Chapter 12). The latter requirement held force well into the nineteenth century in many of Maryland's Tidewater counties (Kilty 1808:October 1753 Session, Chapter 16, note). Military supply difficulties during the Revolution (1775-1783) highlighted the sorry condition of Maryland's overland transportation system (Leviness 1958:17). During the early national period (1783-1800), the newly independent state began to adopt a more activist role in the proper development of dependable roads and bridges. Taking initial shape through legislation enacted in the late 1780s and early 1790s, the Internal Improvements movement in Maryland was characterized from the first by a reliance on public-private partnerships, in which the balance of official action and entrepreneurial incentive often varied (Livingood 1947:7-20; Rubin 1961:63-72). Both turnpike and canal projects, however, incorporated provisions for bridges. Baltimore interests, seeking to keep the trade of western Maryland and the Susquehanna Valley away from Philadelphia, demanded better roads; a petition submitted prior to the 1787 turnpike legislation depicted conditions as they were: The public roads leading from Baltimore-town to the western parts of this state, by means of the great number of wagons that use the same, are rendered almost impassable during the winter season, and the ordinary method of repairing said roads is not only insufficient, but exceedingly burdensome; and the establishment of several turnpike roads in the said county would greatly reduce the price of land-carriage of produce and merchandise, and raise the value of the land in the said county, and considerably increase the commerce of the state [Hollifield 1978:2]. The 1787 act responding to this appeal authorized three major turnpikes to be built and administered by Baltimore County as toll roads. A turnpike from Baltimore to Reisterstown would diverge at the latter community to reach both Westminster and Hanover, Pennsylvania. A road from Baltimore to Frederick would also be built, along with a turnpike linking Baltimore and York, Pennsylvania (Sioussat 1899:144-145). By 1805, the plan for county administration having failed, none of the three turnpikes was completed, and there is no evidence that any of the sections finished utilized improved technology (Hollifield 1978:2). Nonetheless, with private financial backing later in the nineteenth century, all three roads would eventually be placed in operation, as the precursors to present-day Reisterstown Road (with Westminster and Hanover pike extensions), Frederick Road, and York Road (Hollifield 1978). In 1794, the General Assembly revised the general road law of the state, leaving most road work in the hands of the counties but setting up a system of Levy Courts to govern road and bridge construction (Kilty 1808:November 1794 Session, Chapters 52 and 54). Bridge repair specifically was to be performed by laborers hired by the courts, except in cases involving "framed or arched bridges exceeding fifteen feet in length" (Kilty 1808:November 1794 Session, Chapter 52). This was an early recognition that construction and maintenance of such bridges might involve special expertise not possessed by the average laborer. A county's levy court justices were also permitted to raise through taxes as much as 30 pounds annually for repair of a single bridge and as much as 100 pounds for construction of any new bridge (Kilty 1808:November 1794 Session, Chapter 54). Significantly, the 1794 law required cooperation between adjoining counties in building or repairing bridges over county lines. Such bridges were to be contracted out to workmen through a process of bidding and receipt of proposals (Kilty 1808:November 1794 Session, Chapter 54). Like previous general road laws, the 1794 enactments were an attempt to systematize and control the burgeoning road network of Maryland in the early period of agricultural consolidation and waterpowered industrialization. The 1780s and 1790s also saw legislative chartering of bridge companies and canals. Associated persons were authorized to build an unspecified span over the Potomac, and in 1795 a drawbridge was specified for the Eastern Branch of the Potomac (or Anacostia River), where both the port of Bladensburg and the nation's capital (founded 1791) were located (Kilty 1808:November 1791 Session, Chapter 81, and November 1795 Session, Chapter 62). Legislation setting up the Susquehanna and Tidewater Canal and the Chesapeake and Delaware Canal included provisions requiring each canal company to erect bridges over its waterway wherever such crossings were necessary or customary (Kilty 1808:November 1799 Session, Chapter 16). 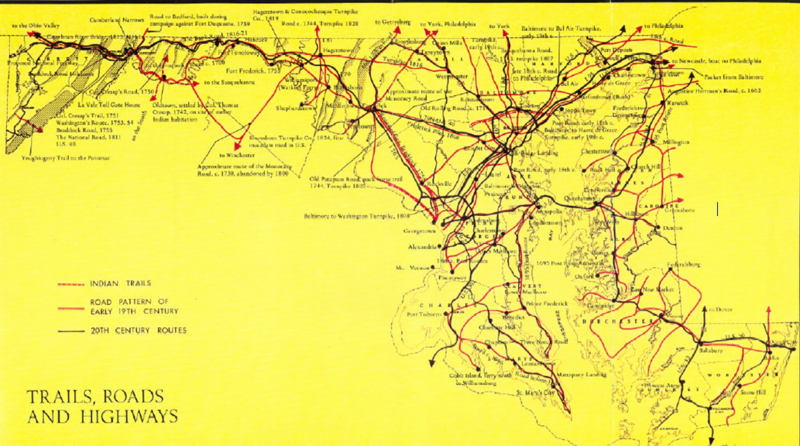 These early Assembly charters for private firms to build transport routes and associated structures anticipated the phenomenal build-up of Maryland's transportation network during the nineteenth century, a growth largely planned by corporations working in tandem with state, local, and federal officials. The canal laws of the 1780-1800 period, as well as the turnpike legislation and the general road law mandating a proposal and bid system for intercounty bridges, signified that economic and technological change was on its way, reflecting the impact of the Industrial Revolution on Maryland's time-honored roadmaking and bridge building tradition.